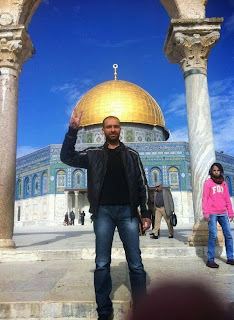 Gaza, December 25, Samer Tariq Issawi, born December 16, 1979 in Issawiyeh, north east of Jerusalem, is a Palestinian iconic hero of nonviolent resistance. On 15 April 2002, Samer was arrested by the Israeli army in Ramallah as part of “Operation Defensive Shield” during the Second Intifada alleging he was affiliated with the Democratic Front for the Liberation of Palestine. Nearly 10 years later, in October 2011, Issawi, then serving the ninth year of a 30-year jail sentence, he was released along with 1027 Palestinian prisoners as a result of an Egypt-brokered deal between Hamas and the Israeli government for the return of Gilad Shalit, Israeli soldier kidnapped by Hamas on Gaza’s borderline. However, on 7 July 2012, he was arrested again. His lawyer Andre Rosenthal stated that he had been taking his car to be fixed at a garage in the West Bank. 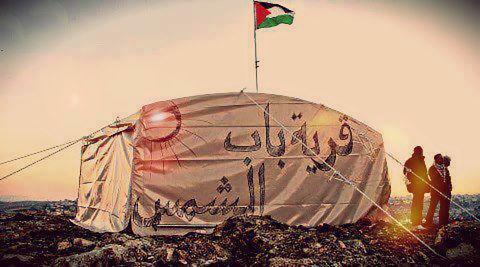 He was convicted of an 8 months sentence so he went on an open hunger strike since August, 2012. Palestinian political prisoner and resistance icon Samer Issawi was released on Monday after spending over 17 months in the Israeli occupation detention centre Shatta Prison. 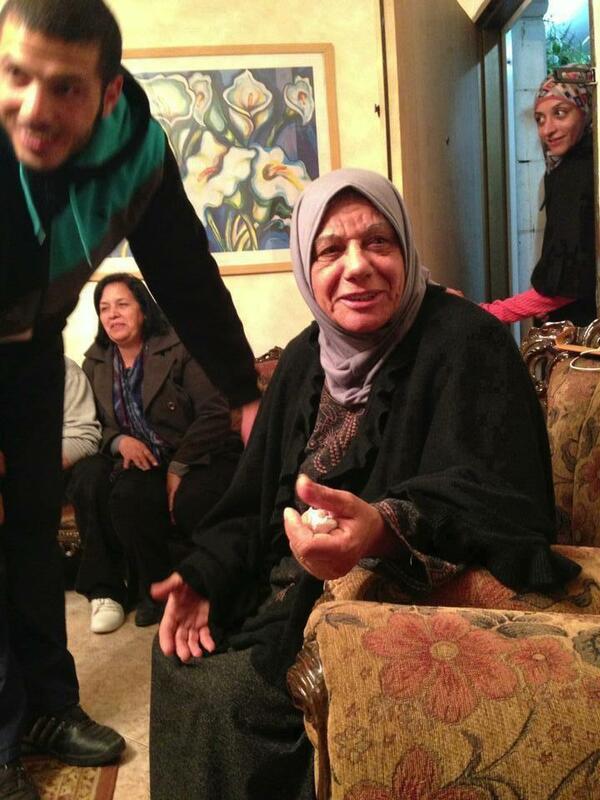 "Samer Issawi's family was ordered by Israeli terror police earlier today not to celebrate and to take down the flags raised at their home," according to The Free Samer Issawi Campaign page on Facebook. 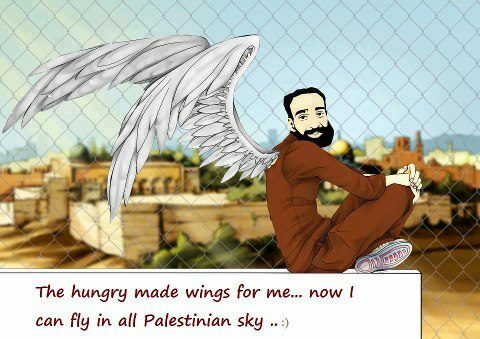 Issawi ended his 265+ day long hunger strike on 23, April 2013 after accepting a deal brokered by Israeli and Palestinian officials to serve eight months on charges of violating bail conditions for an earlier release. The law, which has been in place since the end of the British mandate in Palestine in 1948, allows for the arrest of Palestinians if they are deemed a "threat" to Israel's national security. 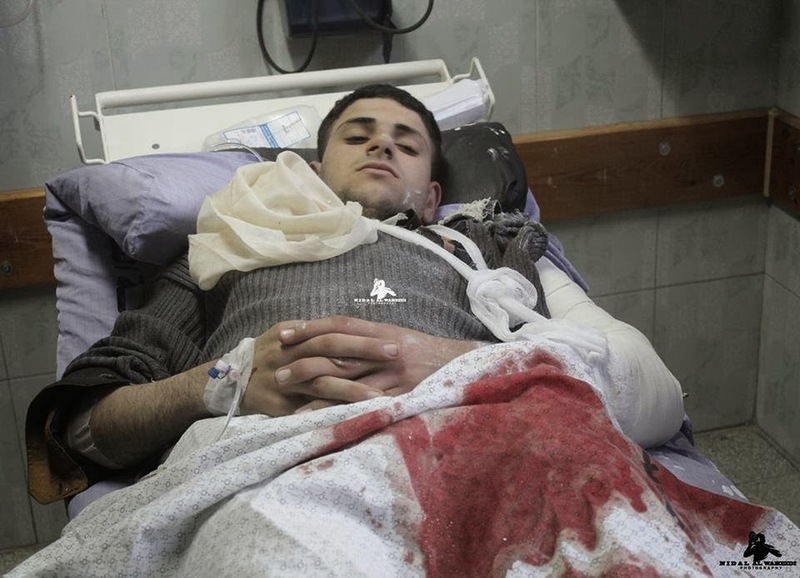 Samer endured hell from his warders happen to be the occupiers of his land. They tried every possible physical and mental torture strategies to stop him from hunger striking but they failed. He stayed strong, he represented steadfastness and preferred death than giving in to injustice. Samer said it loudly to the Electronic Intifada: “ I would prefer to die on my hospital bed to being deported from Jerusalem. Jerusalem is my soul and my life”, and he meant every word. He defied occupation with nothing but an empty stomach and won, he never compromised. They offered him a deal of being released and exiled to Gaza, he refused, he insisted on returning back home to Jerusalem and he got what he wanted. His defiance gave hope to the Palestinian masses inside and out of Palestine, he reignited the spark of popular resistance and proved that nonviolent resistance actually works. His release inspired festivities and celebrations across Palestine. 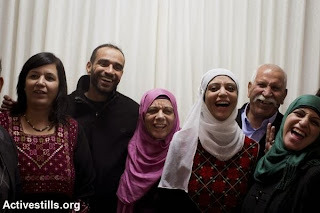 Samer’s family got popular too, they showed the same defiance when they talked to the media but the rising star was his sister Shireen Issawi, who represented the strength of Palestinian women. Shireen never gave up, she fought viciously for her brother on social media and stood by him every step of the way. Shireen became a role model and a symbol of strength and endurance, just like her brother. 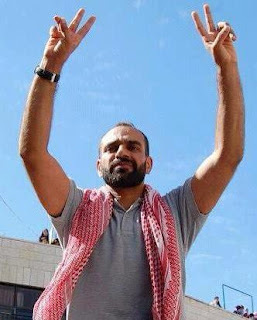 Medhat Issawi, brother of Samer Issawi, was released only a few days before Samer after spending nearly 20 years off and on in Israeli jails for participating in protests and intifadas. It was definitely a happy day for Palestine and a historic one nonetheless. 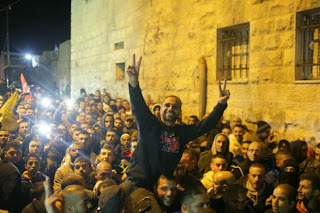 Gaza united with the West bank and was anxiously waiting for Samer’s release. 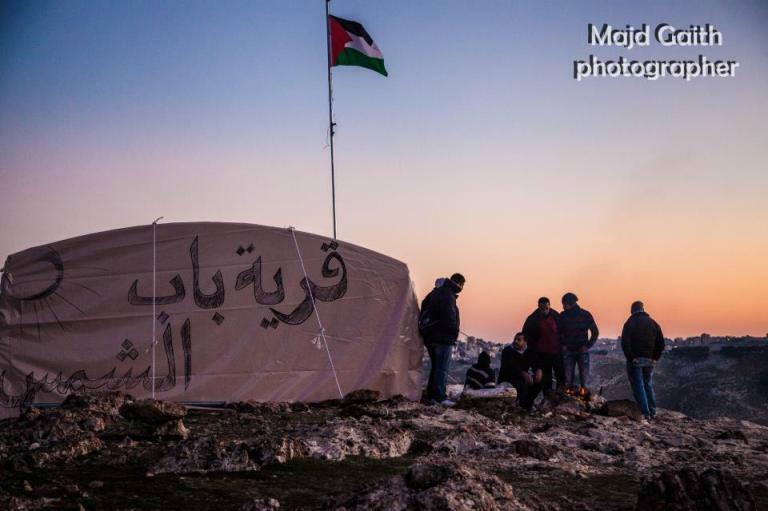 It was a national celebration and Gazans made sure they are a part of it and sent their love and support to the Issawi family even though many couldn’t track his release through live coverage due to daily power outages. Samer Issawi is free, Palestine will be free. Gaza, December 24, As Bethlehem gets ready for Christmas eve, Israel attacks Gaza killing one child and injuring nine others. 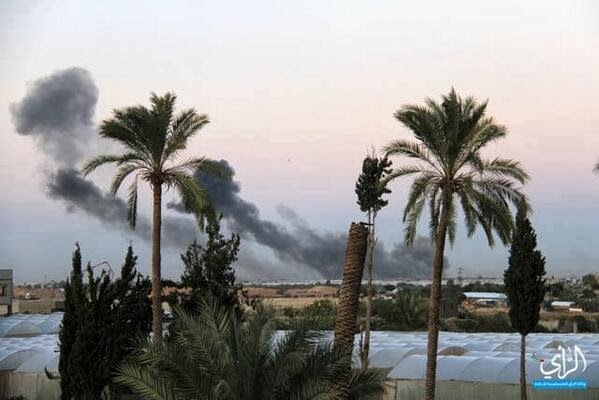 Israeli tanks, un unison with Israeli drones and F16s, carried out 15 attacks across Gaza targeting Western, Eastern, Southern and Northern areas in two hours. 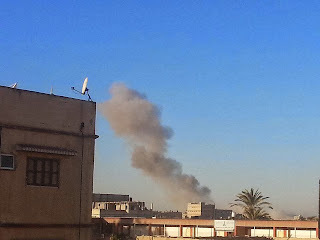 Homes, camps, training sites and free zones were among the targeted places. 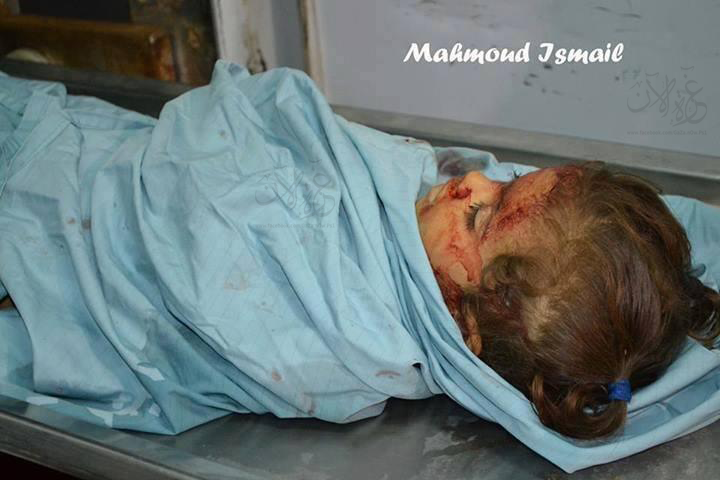 Israeli shelling on Maghazi camp, Southern Gaza, caused the death of Hala Abu Sbeikh, 3 and a half year old. Hala’s mother and brother got badly injured too. Nine got injured, four of them are children, during the attacks. 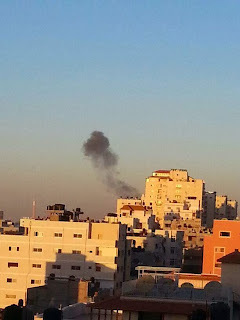 As Christians celebrate Christmas around the world, Gaza’s Christians are terrorized by heavy Israeli attacks on Gaza. Ho Ho Boom, Have a Merry Safe Christmas. That’s life in occupied Palestine, thanks to the Israeli occupation. This week, the Gaza Strip witnessed the unprecedented birth of two African lion cubs at the Beesan Zoo, a facility in the northern part of the densely populated Strip that was built and opened by the Islamist Hamas movement. But just three days later, the cubs died, from unknown causes. The mother lioness, who was discovered to be pregnant nearly six months ago, received extensive medical care, including vaccines, vitamins and good nutrition, before delivering the cubs naturally. Sijeel is also mentioned in the Qur’an as fiery rocks that rain down on unbelievers. The birth of the cubs had taken Gaza by storm, with their pictures going viral on social media. Palestinians say it’s nice to have some good news out of the area that is better known as the site of heavy clashes between Israelis and Palestinians. 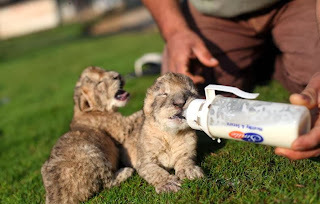 The parents of the cubs are the only lions in Gaza. They were smuggled in from Egypt four years ago, when they were only three months old, through the Rafah tunnels, which previously existed on the border between the Palestinian territory and Egypt. The Egyptian and Israeli armies have since destroyed most of these smuggling tunnels. 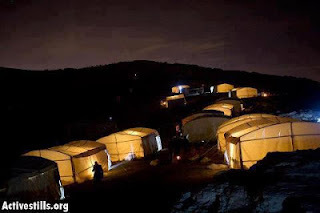 The new cubs, too, had to be warmed due to the current cold temperatures in northern Gaza. Gaza’s three small zoos include apes, monkeys, parrots, lions, snakes, ostriches, various kinds of birds and chickens. Mohammed Jumua owned a small zoo that was completely destroyed by an Israeli rocket in 2008. Dr. Saud Shawa, owner and founder of Vetco, Gaza’s first veterinary services center and clinic, said that Gaza doesn’t have the proper capabilities to raise cubs or lions. He predicted that if not done carefully and correctly, the lions could die or become dangerous. His prediction came true three days later. 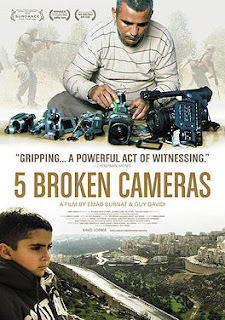 Gaza, April 29, ‘Five Broken Cameras’ is an award-winning documentary (94 minutes) that was directed and created by Emad Burnat and Guy Davidi. It’s also an Academy Award nominee for “Best Documentary feature”. The plot is a mere adaptation of reality. Its about a portion of a Palestinian farmer’s life, Emad burnat, and his nonviolent resistance against occupation and oppression which leads to the damage of five cameras. Emad never stops filming even after getting shot, being arrested and facing a lethal accident that left him with serious injuries that took a long while to heal. But will his emotional scars ever heal? Its important that Palestine was represented at the Oscars this year, although our existence doesn’t need any further proof. Most predicted that the documentary wont win, but its participation was enough. I’m happy that the documentary didn’t win an Academy Award because it deserves more, its beyond Oscar winning. If it won an Oscar it will be known as the Palestinian Documentary that won an Oscar, which in my opinion is very limiting and handicapping, this documentary held the plight of the Palestinian people and their devotion for peace, freedom and resistance. Its better be known as the documentary that told a huge part of the Palestinian story from a native narrative. Its larger than any award it can ever win. ‘Five Broken Cameras’ won the “World Cinema Directing” award on the category of Documentaries at the Sundance Film Festival, and the “Special Jury and Audience” award at IDFA Film Festival. It was described by The New York Times as “A moving and rigorous work of art”. You would think 94 minutes are too long but not in this case. I sailed through those long minutes very smoothly yet very emotionally provoked by the organic, real and raw material. It’s a very colorful documentary, lets not forget that black is also a color. Its narrated by Emad Burnat, who is also one of the directors and the one who took most of the footage since this revolves around his family, his struggle, his village and his friends. Emad is a self-taught cameraman who found in filming a passion and a way of resistance, nonviolent resistance. 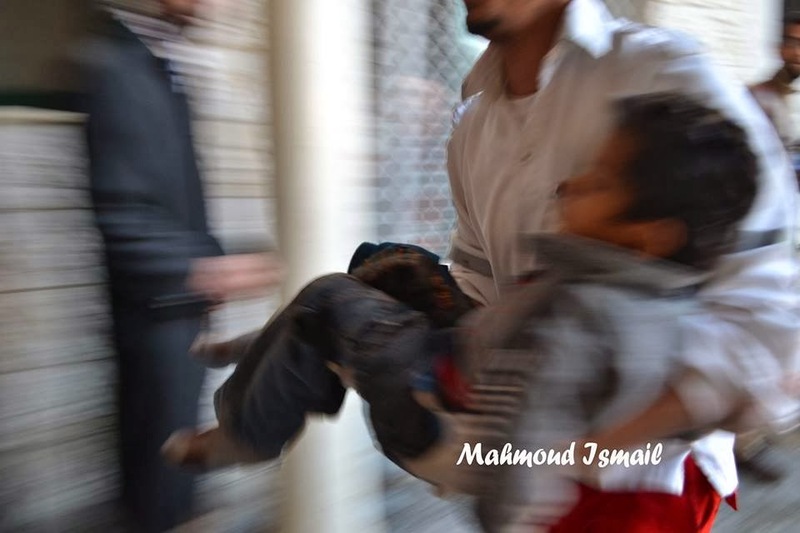 It starts with the birth of Gibreel, Emad’s fourth son, in 2005, Emad gets his first Camera. Gibreel comes with the spark of popular nonviolent resistance in the form of peaceful unarmed protests against the separation wall and the gobbling of Palestinian lands by violent and vicious Israeli settlers who are always backed by the Israeli police and army. Emad takes us through his first-hand accounts of the gathering and organizing of the nonviolent protests that happen each week in the West Bank and gives justice for the Israeli and foreign activists who help Palestinians a great deal in this peaceful resistance. Many of them have died and got seriously injured by the Israeli Army but they are always there to help Palestinians. 1- Palestinian women and the importance of their role in the society. 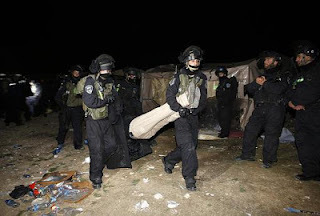 2- Children arrests that are usually done by the Israeli army at night, dragging little kids out of their beds (not shown in the documentary, only the arrests are shown). 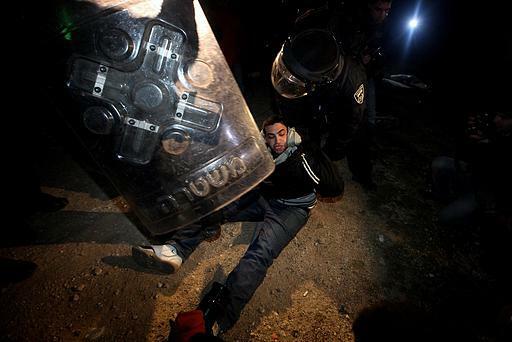 3- How vicious and violent the Israeli military is, and how they can arrest anyone unrightfully. 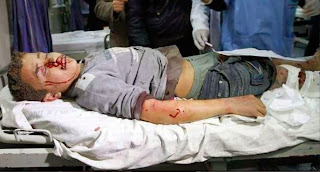 4- How vicious the Israeli settlers can be, and how violent, especially when backed by the Israeli military. 5- The amount of teargas that Israel uses against civilians protesting nonviolently is like pouring rain, teargas is very dangerous and suffocating, and if the canister hit the body directly it can cause death. 6- How the Israeli military jeeps are always around in the West Bank. 7- How united Palestinians are in both Gaza and the West bank despite the political separation. 8- How selfless Israeli and foreign activists are, they endanger their lives to protest peacefully side by side with the Palestinians and always pay a high price for it by either being killed or injured or deported. Perhaps one of the most shocking and frightening scenes was when Bassem Abu Rahmah’s brother gets arrested by the Israeli army, they blindfold him and then shoot him in the leg on a very close range. The documentary included many chilling scenes like the weekly protests and how violent they can get, Emad’s lethal accident that leaves him nearly dead and the arrest of little children and how devastated their mothers would be. But the most chilling, horrifying and most devastating scene is when Bassem Abu Rahmah gets shot directly in the head and chest with a teargas canister by an Israeli soldier and dies nearly instantly. I lost my breath. The ambiance that you feel whenever the scenes included Bassem was happy and smiley and hopeful. Children loved him and he was always smiling, singing and spreading hope. He was never violent or armed, they killed him when he was shouting “You just shot an Israeli girl”, he was trying to save the Israeli activist. His death shocked the whole village and everyone participated in his funeral. The documentary is filled with a mixture of happy and sad moments, not really ambiguous, just the contradictions of real life that we all pass through, sometimes on a daily basis. I will be contacting both Guy and Emad for a possible screening and appearance in Gaza, hoping that this will shorten the gap between Gaza and the West Bank. The documentary offers a native narrative and personal accounts not just a perspective. Its very raw, real and revolutionary. Its shows, even if on a small scale, the Palestinian determination and their defiance of oppression and occupation. Nonviolent resistance has been a trending method in Palestine adopted by many people and backed by international activists. This documentary turns the Palestinian life from a number or a name into a story and an existence. Emad keeps the camera rolling even during his most intimate moments, he shows us his family and home, he shares his friends with us and fights against occupation with a camera, or shall I say Six cameras? Each Camera has its own story and marks a phase in Emad’s life. The documentary ends with a promise (or a pledge) made by Emad to keep filming no matter what it takes, which resembles and the fight of Palestinians against occupation which also continues no matter what it takes. The Audio bridge was on point. Le Trio Jubran’s music made the documentary even more chilling and supported the narration and the events very well. Gaza, April 23, Samer Issawi is set to be released 8 months from now.In a brokered deal between the Israeli authorities and Samer's lawyer and family, Samer Issawi will serve another 8 months starting from today and then be released and back to his home with no conditions or any foreign exile. Rumors have been spreading online for a while about so many deals with so many different details but this deal was confirmed by Samer's family and lawyer, which means that it will happen if Israel doesnt break its promise and slam the deal against the wall. Its noteworthy that Israel is unpredictable and doesnt keep promises, so lets pray and hope and see. Samer Issawi was released back in October of 2011 as a part of Shalit's release deal. 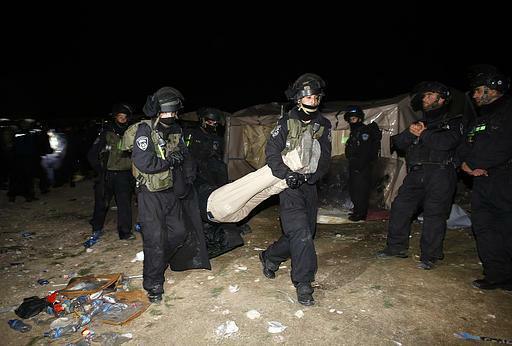 Israel released 1027 Palestinian prisoners in return of Hamas's release of Israeli soldier, Gilad Shalit. 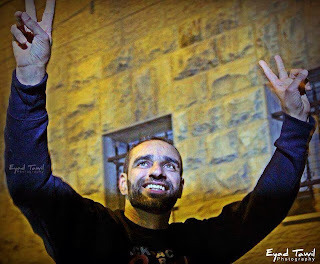 Israel then re-captured Samer Issawi in 2012 and held him with no charges or trial. Samer started hunger striking for freedom and till yesterday he passed over 8 months of hunger striking breaking any world record out there. No word yet whether Samer ended his hunger striking or not, but he went back to taking his Vitamins after stopping for a day or two in a step of escalation. Samer Issawi has seen unprecedented support from inside and outside of Palestine, people everywhere stood by him and showed support by taking the streets and hunger striking in support of him and honoring him in a way by appreciating his bravery. Samer Issawi's family, especially his sister Shireen who works as a lawyer, played a great role in imposing pressure and raising awareness about Samer's case. Social media also helped in channeling support and creating awareness and pressure. In 8 months from now, and only a week before 2014, Samer Issawi will be released and back with his family so Palestine can enter a new year full of hope and anticipation for freedom and justice. 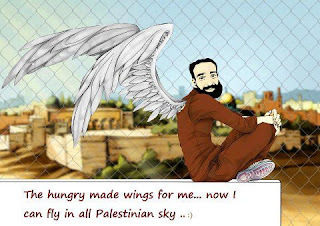 Samer Issawi turned into an iconic figure, a hero and a representative of Palestine's steadfastness and strength for choosing to starve himself for freedom. Palestinians look up to him for he has given them hope and faith in a better tomorrow, Samer will be free and Palestine will be free. 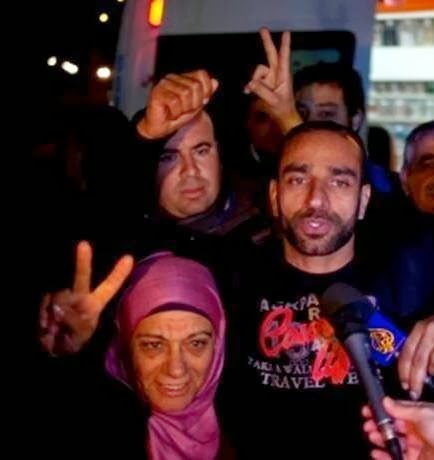 Samer Issawi lost allot of weight and his health is in mere danger, he will need a long rehabilitation time after his release to revive his weak body who kept fighting while being fueled with a strong will and a thirst for freedom. Don’t you know the sun will always shine? Don’t you know that the land is mine?